Student Matthew Gibbs proposes Canadian "Freezeway"
News: a seven-mile-long skating rink proposed for the Canadian city of Edmonton could allow commuters to ice skate or toboggan to work and school during winter months (+ movie). 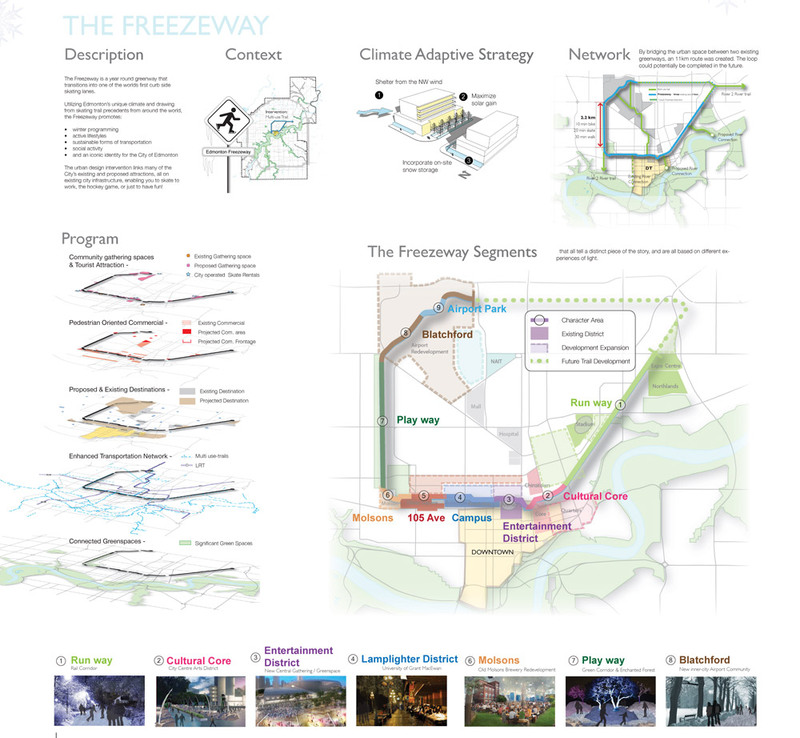 The Freezeway is the vision of landscape architecture student Matthew Gibbs, who designed the ice trail as a thesis project. The concept was selected as the winner of a 2013 design competition, but there are now plans to pilot the scheme in the city next winter. The trail would bridge two existing greenways to create a seven-mile-long route that would freeze over in winter to produce a skating trail, but could also be used as a bike lane and promenade during summer months. "The Freezeway project looked at the hidden opportunities that exist living in a climate that is on average below freezing for more than five months a year, necessitating the development of more free, fun activities to lure people outside in that very sedentary and isolating time of your," explained Gibbs. He imagines local residents using the path to skate for leisure, or to get to work. The project was the winner of the 2013 COLDscapes contest, launched by Kent State University's Cleveland Urban Design Collaborative, which called for architecture and design proposals tailored to cold climates. "The essence of this idea was building a skating trail for the city of Edmonton – it was the number one request by citizens in the survey conducted by the winter city strategy, asking people what they would like to see to make winter life more liveable," said Gibbs. Parts of the envisioned route would run alongside the city's railway tracks and roads, while others would cut through parkland and plazas. Shops, cafes and skate rental offices would be dotted along the route for convenience. Visualisations for the project show the path illuminated by icicle-shaped lamp posts at night. Metal prongs arching from each post would allow icicles to form in winter, while in summer water jets set into the arms would spray a cooling mist into the air. Rubberised crossing points would allow pedestrians and vehicles to negotiate the frozen trail without the risk of slipping. A prototype of the trail will be piloted at the Edmonton Ski Club next year, funding for which Gibbs imagines will come from crowdsourced donations. "This project is not meant to be a tax payer's burden," he told Dezeen. The overall cost of the project is as yet unknown and Gibbs' proposal outlines three variations of the trail – a naturally frozen path, a refrigerated version and a carved ice block. "We are going to be undertaking exploratory conversations with stakeholders," a representative from Edmonton City Council told Dezeen. "Edmonton is a northern city, and we are always looking for creative and innovative ways to embrace our winter-ness and make winter more enjoyable for our citizens and guests."